NEW YORK - Dec. 18, 2018 - PRLog -- Even Bill Gates Agrees… Technology companies have gone too far! "The government should be talking to these companies about what they do" Bill Gates, co-founder of Microsoft has said. "I was naive". The European Union has already pushed through sweeping privacy regulations limiting what data can be collected on citizens and how it can be used. Most Americans support similar regulations. The stakes in cybersecurity are high, and you need to stay informed. Luckily, you don't have to spend all day surfing because blurb blast curates, parses and posts the latest Tech, Security, Cloud, Big Data, Hacker, Software, and Crypto news from 150+ sources via real-time feeds, and also publishes, a daily, downloadable newsletter. 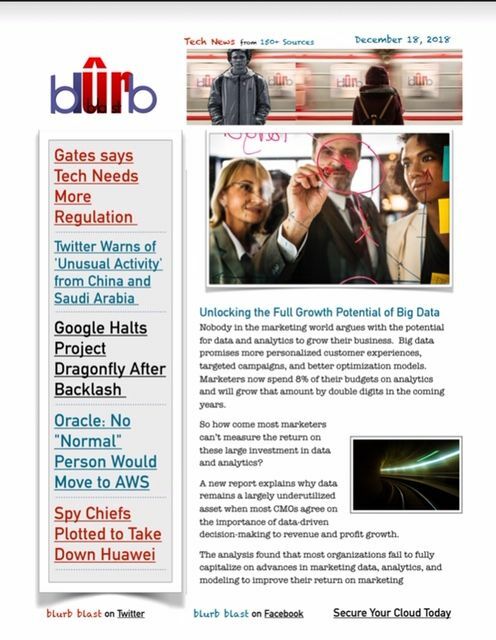 These blurbs and dozens more are blasted every day so click over to https://www.facebook.com/BlurbBlast, Twitter, Medium or download today's issue of blurb blast at to catch up with all of today's HOT Tech News.